My Home and Garden: Too hot to do too much today, so why make jam? I knew when my thermometer said it was over 20 degrees when I got up, that it was going to be a hot day. It was. Allan vacuumed the paint remnants out of the greenhouse. I reorganized it after the paint cleaning upheaval. It looks great again. Then I started picking through the raspberries that I picked up at Thrifty Foods. They are BC grown and I can tell that they weren't bred for travel. There were lots that were moldy, but I just took the time to be picky! I made my first batch of jam in about 25-30 years. Allan just had a bagel with some of the jam, and it passed muster. He deemed it delicious. 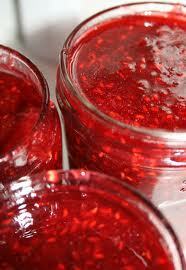 It really was too hot in the kitchen for making jam, but it had to be done or the berries would have been compost. I pruned the rose bush way back to force another wave of blooms. It is Perdita, a David Austin rose. I've had it for about 20 years. I took the hedge clippers and trimmed the pinks. Again to force another wave of bloom. I planted a pot of catnip for the kids. I made up a batch of the organic fertilizer that I posted the recipe for last week. I made it in one cup increments and that did the whole garden. So that made seven cups of dry fertilizer. Perfect. My sister came for a visit. It was a great diversion. She is such a treasure to me. We had big glasses of ice water and chatted under my umbrella. It was just such a good, good day.